He refuses to use a mm and when I confronted about what he was saying about me he removed me from skype. I doubt this won't get him banned but I feel he should be for the safety of the community. Last edited by Rage; 08-13-2013 at 05:03 AM. The chat logs need to be unedited. If you can not provide these within 24 hours the thread will be closed. The person who had original contact with the user should be posting them also. This part is from me. 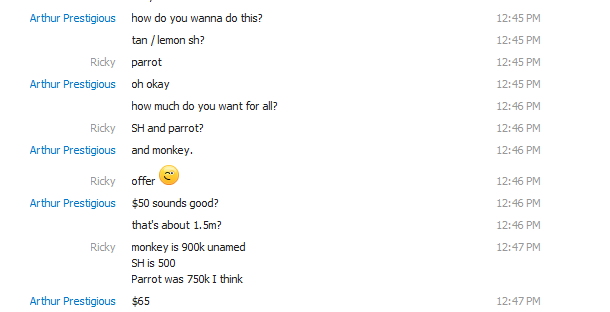 I questioned him about it and he instantly removed me from skype.. He's an obvious scammer. Because he has an issue with you? As I stated, until unedited screenshots can be posted by the original person (and verified over TeamViewer) nothing can be done. Until that happens he is as innocent as you and I. Going around and posting "Trade with Caution" because he wouldn't use you as a Middle Man isn't really acceptable, either. Okay I removed the first photos this has to do with me and roflicoxd then. Originally he was supposed to buy some items on puzzle pirates and he logged off then ignored me for a while then a friend came to me and said he was saying like I will scam him or he's high and doesn't want to use me as a middle man. I honestly don't care if he doesn't want to use me as a Middle man, he refused to even ask or have scarecrow do it. I'm just trying to help the community with him because someone will get scammed and you guys could of done something about it. Like usually you let them walk. I don't believe you know how to read. Your friend wanted to trade with this user. User refused to use you as a Middle Man. You report him for being an "obvious scammer"
At first I wanted to trade with this user to sell him a familiar for paypal which he agreed to. He went offline and didn't come back for hours so I sold some to another buyer and had one left. Once I said sent him this message "Me and rage had some problems, I'm not using him" quoiting him he instantly replies and removes me from skype. This is started with me but I thought a little more info would help my case. It has nothing to do with my friend. Can I see the logs over TeamViewer?